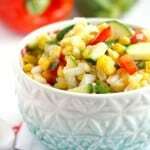 Home » Salad » Easy Picnic Corn Salad. 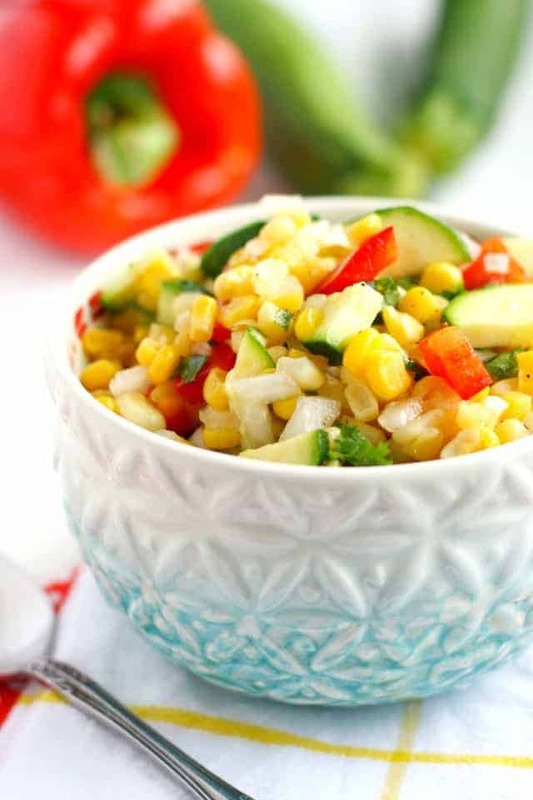 This fresh and colorful picnic corn salad is sure to be a crowd pleaser! Full of peppers, onions, zucchini, and corn, this is a great side dish for a barbecue or potluck. Don’t you love easy, summery recipes that are naturally gluten free and vegan? There’s nothing like a simple salad to bring to a picnic or potluck. Once summer and spring hits, it’s so fun to make all the tasty vegetable recipes. . The Farmer’s Market is bursting with local fruits and veggies, which makes it so easy to make healthy and tasty meals. We’re so happy that we have a lot of Farmer’s Markets in our area. There’s a huge one on Saturday, and a smaller one on Sunday that we shop at pretty regularly. In addition to those, we grow some of our own vegetables in our backyard garden, so we’re never short of fresh produce. This corn salad is so tasty with its sweet and tangy dressing. It reminds me of this corn, bean, and feta cheese dip that we used to make all the time. If you can have dairy, it’s a wonderful appetizer! What is picnic corn salad? 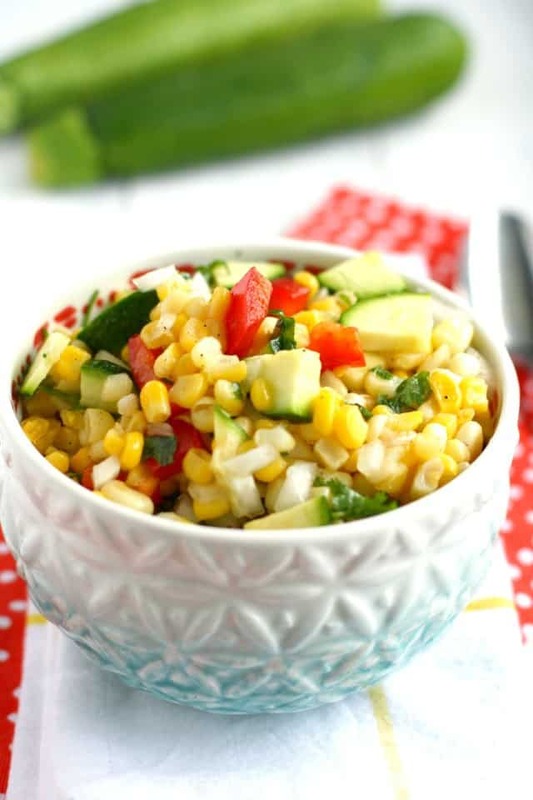 Picnic corn salad is a salad that consists of corn and other vegetables, like zucchini, peppers, and onions, and is dressed with a sweet and tangy salad dressing. It’s the perfect side dish for grilled chicken or burgers. It actually improves as it sits in the fridge, so this is an easy recipe to make ahead of time. What if I can’t have corn? This dressing is really delicious, and would work well with a lot of different combinations. Try black beans, or diced tomatoes, or even shredded carrots in place of corn. This recipe for picnic corn salad is one that I have been making for years…I just now realized I’ve never shared it here! I’ve adapted it slightly from Desperation Entertaining. It’s one of those recipes that is so easy to throw together (it only takes 10 minutes) and makes a really big impression. The sweet corn, fresh zucchini, peppers, and cilantro in a simple vinaigrette just screams summertime. If you’re having a barbecue, take the time to make this corn salad – it’s much more fun than a bagged salad, and everyone loves it. 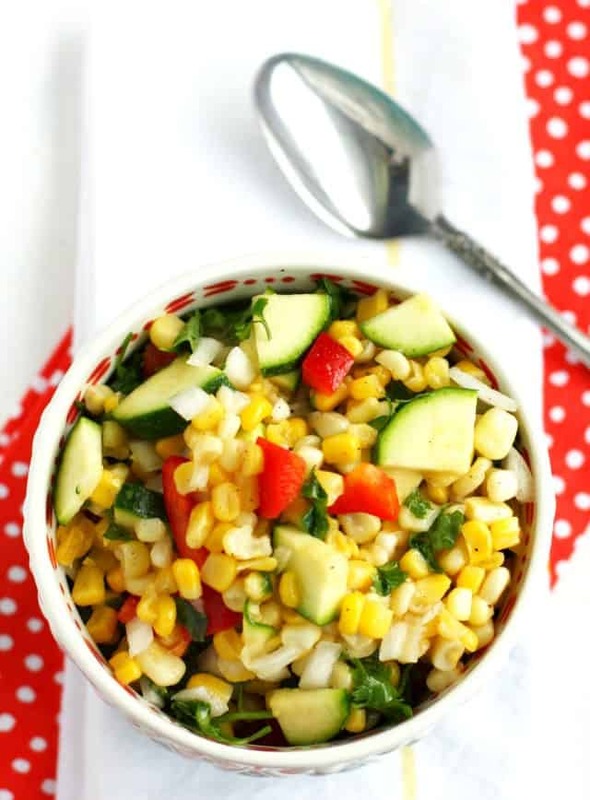 Simple, fresh, tasty picnic corn salad is a summertime favorite! Put the corn kernels in a colander and rinse under cold water until thawed. Drain well. Place the corn kernels, onion, red pepper, and zucchini in large bowl and stir to combine. Mince the cilantro and add that to the bowl. Pour the vinegar into a small bowl and add the sugar, oil, salt, and pepper. Whisk together. Pour the dressing over the vegetables and stir well. This salad should stay fresh in the refrigerator for 4-5 days. If you can't have corn, try shredded carrots, black beans, or green beans. What have you made with summer veggies lately? This post was originally published in July 2015. It has been updated. « Gluten Free Pepperoni Pasta Salad. Any recommendations to replace the cilantro(it tastes like soap to me)? This recipe looks awesome otherwise. Any fresh herb that you like! Parsley, basil, etc. Can the picnic corn salad be made 3 days ahead by chance? Yum! This looks like a delicious way to enjoy summer vegetables! It’s so pretty, too! Oh how I love corn! Summer corn is the BEST! I’m always looking for new ways to eat it instead of just on the cob. Looks like I’ve found a way! If you try it, let me know! I never realized how much I adore corn…but I do…A LOT! Corn salads are the best! I think I could eat this every day, especially during the summer. Love the flavors in here! This is the perfect way to use up all that summer corn! What a gorgeous summery salad, Kelly! What a beautiful photo! I love the idea of your site too.. allergy eats, so clever! Perfect idea for those who need a nice crisp side sans the top 8 allergens :)!